The biggest claim to fame of this driver is the 9-point face technology. This is a rhombus insert surrounded by a titanium perimeter. The titanium perimeter is even thinner then the milled rhombus face insert. What does all this mean? The ball will fly far no matter where you hit it on the clubface, because this technology increases ball speeds over the entire face of the driver. 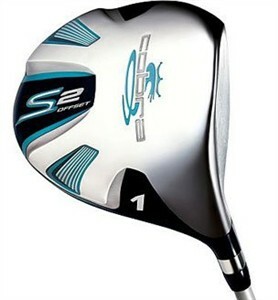 I like this driver for the price and would recommend it for high handicappers. The face is really hot and forgiving. However, for some newer technology, I would recommend the Women's Burner Driver 2009. It's not offset, but it is very forgiving. I also like the TaylorMade Lady R9 Supertri Driver, because you can adjust the driver head to your swing. Adjust it closed to help you square the driver, and after you improve, adjust it back to neutral.